I'm a day late on this post but Happy (belated) National Cupcake Day! I've had a five year streak of mediocre/bad cupcakes on this day and I'm pleased to announce that I finally have broken that streak. While the cupcake wasn't OMG amazing, it was still pretty tasty. I patronized a cupcake bakery located in the historic River Market neighborhood of Kansas City. 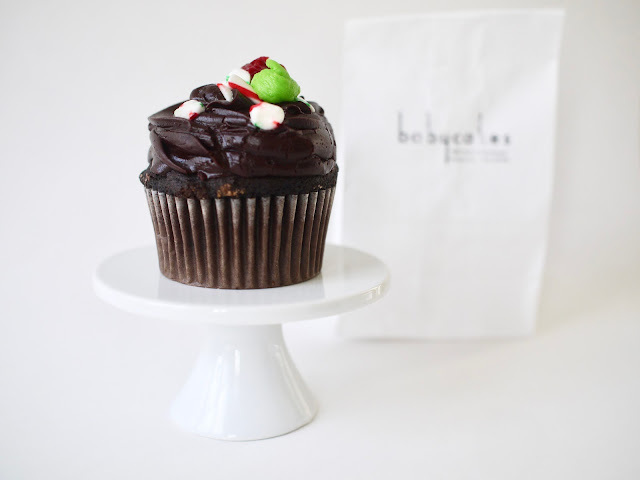 Baby Cakes had an assortment of cupcakes available and my eye caught a festive chocolate cupcake topped with mint chocolate frosting. Each cupcake is $3. The cupcake had a good balance of mint and chocolate and it wasn't too sweet. The crumb was fluffy but was a tad on the dry side. It was a festive treat on a busy weekend filled with lots of holiday concerts. And I'm so glad I found a good cupcake nearby my apartment.